Stahl Mennonite Church in Johnstown, Pennsylvania in August 1951. Source: Mennonite Community Photograph Collection, The Congregation (HM4-134 Box 1 photo 010.1-21). Mennonite Church USA Archives, Goshen, Indiana. Stahl Mennonite Church (MC), located 6 miles south of Johnstown, Pennsylvania, a member of the Allegheny Conference, had its first meetinghouse erected in 1882, called "Stahl" because the land was donated by John Stahl. 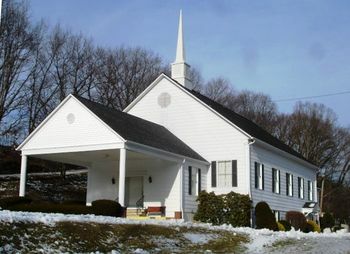 This congregation was served by the Johnstown district ministry. The point at which it can be considered a separately organized congregation is difficult to determine. The conference minutes speak of a "Johnstown congregation" as late as 1896, although there were at that time four meetinghouses (Blough-1836, Weaver-1855, Thomas-1874, and Stahl-1882), and not until 1900 was mention made of 5 "congregations" or meetinghouses in the Johnstown district (Elton was added in 1899), with a total membership of 487. The first Mennonite Yearbook and Directory (1905) lists Stahl with 176 members and S. G. Shetler (ordained 1897) and S. D. Yoder as ministers. Down to ca. 1940 all the congregations of the Johnstown district had one bishop. 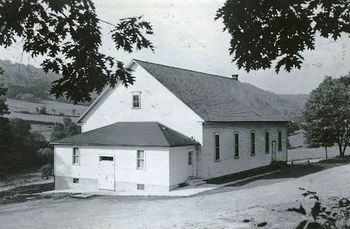 Stahl was S. G. Shetler's home congregation, and it was in its meetinghouse that he established (1922) and for many years (1925-35) served as principal of the Johnstown Bible School. Near the church the Johnstown Mennonite School was established in 1944, offering elementary and high-school work. In 1957 the Stahl congregation had a membership of 154, with Sanford G. Shetler as pastor and bishop (ordained 1952). Men who served this congregation: Levi D. Yoder 1897-1908, deacon; Stephen D. Yoder 1900-1910, minister; S. G. (Samuel Grant) Shetler 1894-1897, deacon; 1897-1914, minister; ?-1942, bishop; William C Hershberger 1912-1935, minister; John F. Harshberger 1913-1945, deacon; Loranza Kaufman 1918-1944. deacon; Lloy A. Kniss 1920, 1942-1943, minister, 1943-1945, bishop; Sanford G. Shetler 1932-1952, minister, 1952-1977, bishop; David C. Alwine 1943-?, minister; Harold E. Thomas 1946-1950, deacon; Levi S. Thomas 1951, deacon; Melvin Nussbaum 1951-1965, Art McPhee 1971-1973, minister; Marvin Kaufman 1971-1977, deacon; Curtis D. Godshall 1973-1985, minister; Daryl Alwine 1981-1985, deacon; David S. Mishler 1981-1982, deacon; Marlin Shetler 1981-1985, deacon; Allen Holsopple 1985-1987, minister; Harold A. Shenk 1987- ? , minister. Kaufman, Ammon. "Stahl Mennonite Church." Southwestern Pennsylvania Conference News VI (January 1948): 3. Bender, Harold S. "Stahl Mennonite Church (Johnstown, Pennsylvania, USA)." Global Anabaptist Mennonite Encyclopedia Online. 1959. Web. 25 Apr 2019. http://gameo.org/index.php?title=Stahl_Mennonite_Church_(Johnstown,_Pennsylvania,_USA)&oldid=133416. Bender, Harold S. (1959). Stahl Mennonite Church (Johnstown, Pennsylvania, USA). Global Anabaptist Mennonite Encyclopedia Online. Retrieved 25 April 2019, from http://gameo.org/index.php?title=Stahl_Mennonite_Church_(Johnstown,_Pennsylvania,_USA)&oldid=133416. Adapted by permission of Herald Press, Harrisonburg, Virginia, from Mennonite Encyclopedia, Vol. 4, p. 609. All rights reserved. This page was last modified on 4 February 2016, at 06:50.